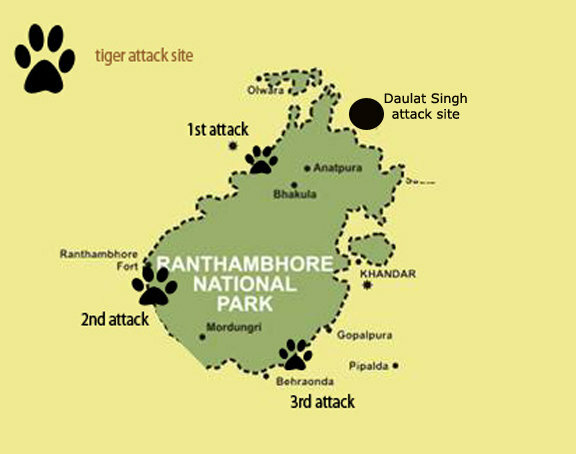 Ranthambhore Tale's.. .: A Tragic day in Ranthambhore.. .
A Tragic day in Ranthambhore.. .
20th august 2010 was yet another tragic day for the tiger and a brave forest ranger. 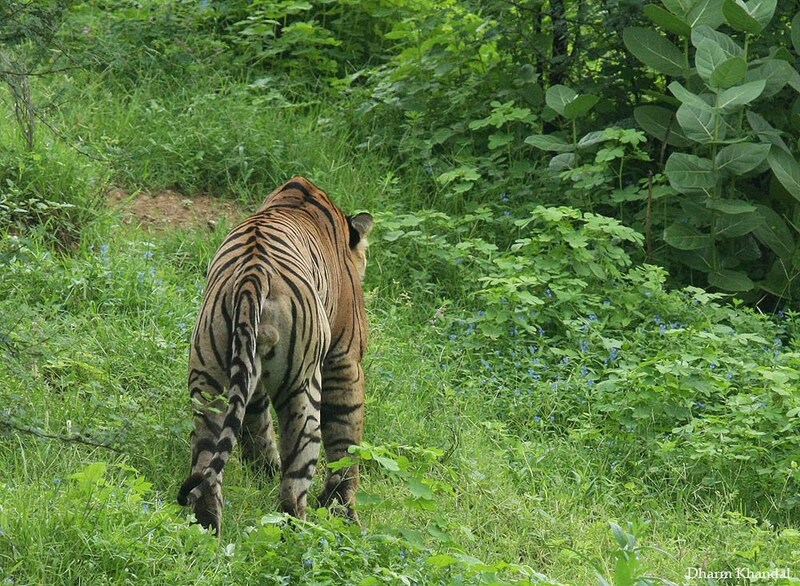 T7 (5-year-old) one of the favourite’s tiger of the tourism zone who shared his territory with his own father T2 (10 year old) unfortunately strayed out of the park due to the overgrazing of cattle by Uliana and Bhadlav villagers and entered the agricultural field of Bhuripahadi village. The Background: At about 3 AM tiger killed one of the buffalo calves of a villager, at about 3.15 AM the villagers discovered this, threw stones on the tiger, pulled away the calf, and informed the forest department. The forest department reached on site around 5 AM and about three canters of police also reached. By then about 1,500 villagers had gathered around in that area, the men and women of the village were creating unnecessary havoc and pressure on the officers. 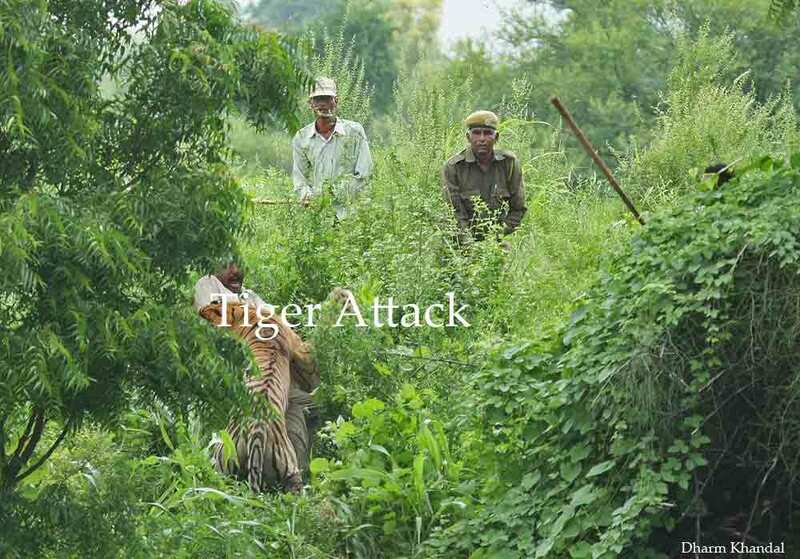 One of the Rangers – Mr Daulat Singh [The most able and efficient ranger of Ranthambhore Tiger Reserve] was cornered by villagers and physically abused. This shoving created stress and strain on the forest rangers. 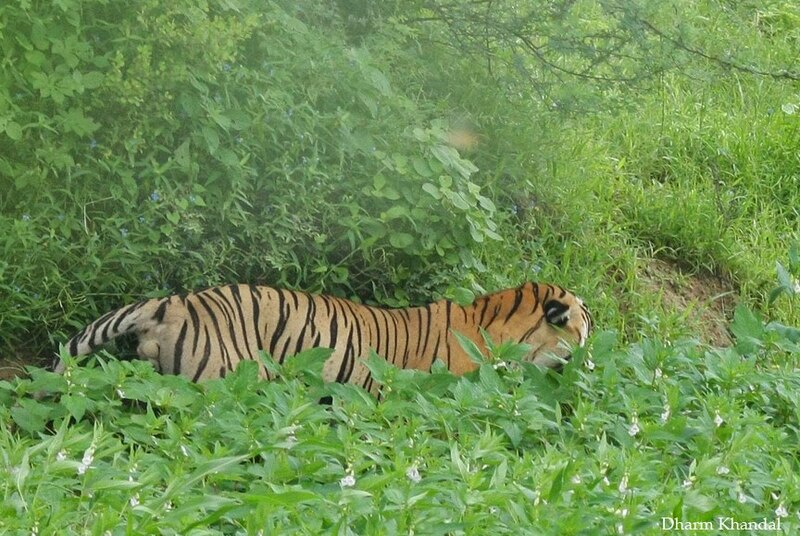 The tiger was equally stressed due to the continuous stone throwing and other noises. 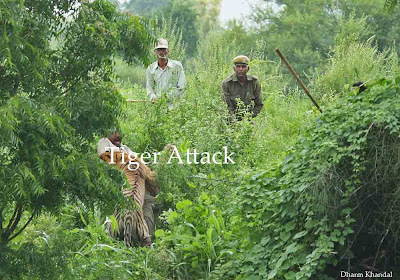 The ranger tried to tranquilize the tiger twice but missed the shot, third time around he tried to bend down and check if the tiger was darted but the tiger made a surprise attack. Daulat Singh Saktawat was gravely injured on hands and face with him losing one eye. He was rushed to the Sawai Madhopur Hospital, which had no electricity in the first place leave alone a sterilized Operation theatre. The state of the hospital was pathetic with no monitoring equipment, no oxygen, no ventilator and room was moist and filthy with fungus on the walls. Crowds of people were allowed to enter at will as if there was some magic show taking place and everyone was invited. Every possible protocol of Emergency Care was violated. Very crude patch up work was being done and that too in the light of a torch and even the torch was not immediately available and was brought by Dharmendra Khandal which was a car light used for Hyena filming. The generator was not working and everything was left to the mercy of God. Under normal circumstances in such a small District town, the General Hospital would be the logical place to take all emergencies, but here there was an option of the best emergency care that was on the way from the site of injury, which was Ranthambhore Sevika. The Sevika Hospital was on the way from Bhuriphadi and would save at least 30 minutes time as that is how long it would take to get to the General Hospital. Sevika Hospital is equipped with the best Doctors and equipment and yet the local officials took the unnecessary risk to take one of their brethren to the General Hospital where even electricity was not available. No basic emergency equipment was available to combat the situation in such case with mob around; a kit should be available with the foresters, which would contain a loudspeaker to pacify the crowd, safety wear for the team such as helmets, and thick jackets (Which could have prevented this incident due to which Mr Daulat Singh ji lost one of his eye). The eye lid was stitched with the cheek in the Sawai Madhopur hospital pretty badly and it will take a lot of work and expertise of the plastic surgeon to correct it. Mr Daulat might not be able to see with one of his eye in the future but the eyes above all of us is looking at the people who let it happen due to their ego's and impassivity. Great reporting. Lots of interesting commentary on the state of affairs including some very notable lessons learned. Thanks. Truly tragic. The Human-Animal conflict is part of the package, for the sake of conservation we will have to take such incidents in our stride. For the men on the field it is an occupational hazard. But the support shown by the government and especially the Chief Minister himself is heart warming. Only because of brave and committed people like him, we have wildlife left in our country. Hope he get the best treatment available in the country. salutes to him & others who crossed that extra inch to get things done! I salute to every officer present there, they are brave men, but FD should think of ELEPHANT MONITORING, We nearly lost one officer thank god he is fine. and thanks for this reporting. Very tragic. The awareness of villagers close to the World famous Ranthambor tiger reserve is still in the state of throwing stones at a tiger that strayed close to their village and assaulting forest guards clearly shows what kind of work the forest department is doing. सप्त ॠषि सहगल The environment and terrain of Ranthambhore is not good for Elephants. Introducing them to the forest would throw up all kinds of problems that would take years to sort out and would detract the guards from their important work. Mr. Daulat was forced into a situation for which he had little or no training, exoerience or competency. He was trying his best to do a difficult job. The problem is...doing your personal best is not the right thing to be doing. The guards need to be trained for these situations. 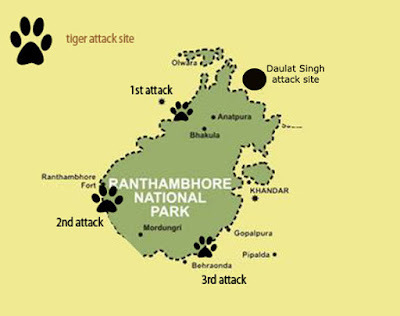 They need an emergency preparedness plan of action that will keep them and the tigers/leopards etc. out of danger. It is wrong, very wrong to blame the tiger for the killing of the buffalo. I have seen so many incidents in India, where the people affected, never look at the root cause of the situation in hand. The owner of the buffalo is totally at fault in this situation. He owned the creature and he was responsible for its safety. He knew that predators lived in the area yet he allowed the buffalo to be exposed to them. It was his responsibility to ensure that his animals were secure and protected yet he did not. The blame for the death of his animal lies firmly with him. The tiger is an innocent opportunist predator. If these people want to keep livestock their first duty is to ensure it is kept in a secure area and managed properly. The truth is they are lazy people who make up for their lack of effort with arrogance and violence. They should be banned from keeping animals if they expose them to such attacks. Mr. Daulat also should have been protecte by his employesr, the Forest Department. If he is to be exposed to such hazards as this then his employers should have risk assesssed such situations and put in place all necessary controls and systems that would have reasonably and practicably avoided his exposure to danger and harm. As it was, Mr Daulat had no protocol to follow and his employers neglected their duty of care towards him by putting him in a situation where he had no information, instruction or training to deal with it and was left to do what he thought was ok.
As it turns out, it was not ok and he suffered severely for the neglect shown to him by his employers! In India it seems that the lives of ordinary, hard working people are cheap. It seems to me that the authorities dont give a damn about the health, safety and welfare of those who take the trouble to get out of bed in the morning and contribute to the nation by going out to work. 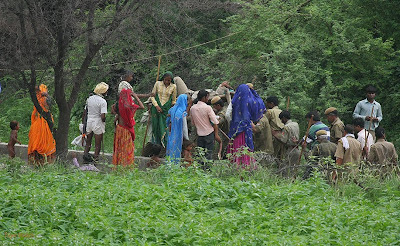 The villagers, such as these idiots in Ranthambhore seem to get all the protection. Could this be something to do with the casting of votes at election times? Here in the UK we had a similar situation right up to about 100 years ago. Then the ordinary people began to stand up for themselves and push for a better quality of life. At first they were slaughtered on the streets of the towns and cities by the soldiers who were owned and paid by the rich and powerful. They put their lives on the line and many lost their lives for doing so. Their legacy lives on in the way of life we enjoy here today. The risks that Mr. Daulat was exposed to would not be tolerated here. We dont have tigers roaming our forests but if we did then systems and methods of management for emergency situations like this would exist in law and anyone who failed their employees would face severe penalties. These are the brave men who make sacrifices in the face of the most difficult situations in man animal conflict in our country.These are the unsung heroes for whom not a drop of tear is shed in the face of the most critical situations that they as forest officers face.Unfortunately such braveries go almost unnoticed and forest officers are blamed for the conflict situations arising out of man's encroachment into forests, the abode of wildlife. Long live Mr. Daulat's clan. Oh, This is really unfortunate ! We all pray to god for his early and fast recovery!! I'M PREYING FOR SUCH A BRAVE MAN!!! Daulat Singh is in my thoughts and prayers for a speedy recovery. Sad story of India's Tiger conservation. Another conservationist made a scape goat to cover the forest department's grave mistakes. Dont pay heed to such cheap allegations doc. We know what you are. Keep up the great work. Divya you showed amazing restraint and control over emotions as well as words when you wrote this.